ONI Bureau: Ahead of the upcoming Lok Sabha and Odisha Assembly polls, Aam Aadmi Party (AAP) national convener and Delhi Chief Minister Arvind Kejriwal will visit Odisha on 31st January, AAP sources said. Kejriwal will make his first-ever visit to the state after formation of Aam Aadmi Party. He will attend a public rally organized by expelled Congress leader Srikant Jena. Many other political leaders may shared the dais with Arvind Kejriwal and Srikant Jena at Lower PMG square in Bhubaneswar. 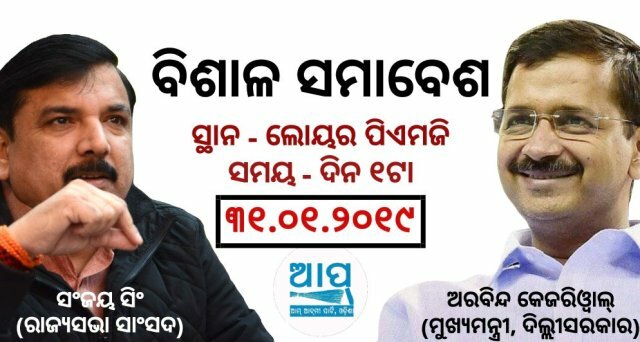 The Aam Aadmi Party in Odisha has urged its volunteers as well as public to attend the rally and listen to Arvind Kejriwal.